Residual herbicides need moist soils and warm temperatures for breakdown to occur within the expected time frame. In dry conditions, the two major breakdown methods – hydrolysis and microbial degradation – will slow down, which elevates the risk that these herbicides will remain active in the soil for longer. Soil residual herbicide levels can actually start to stack up – where residues from last year add to still-present residues from the year before – when dry conditions continue over two or more growing seasons. 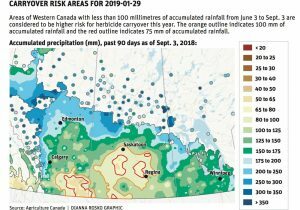 This could be a real risk for 2019 in parts of the Prairies that have been dry for two years and where residual herbicides are commonly used in pulses and cereals. 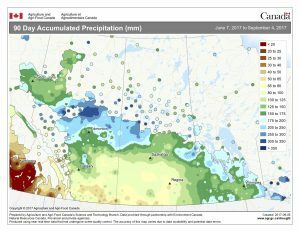 As Agriculture and Agri-Food Canada agro-climate maps show, many of the driest areas in 2018 were also very dry in 2017. Because canola (except for Clearfield) is extremely sensitive to Group-2 herbicide carryover, this risk is something to consider as growers make their cropping plans for 2019. The orange outline indicates 100mm of accumulated rainfall from June 3 to September 3, 2018, and the red outline indicates 75mm of accumulated rainfall. These are the highest risk areas for herbicide carryover. 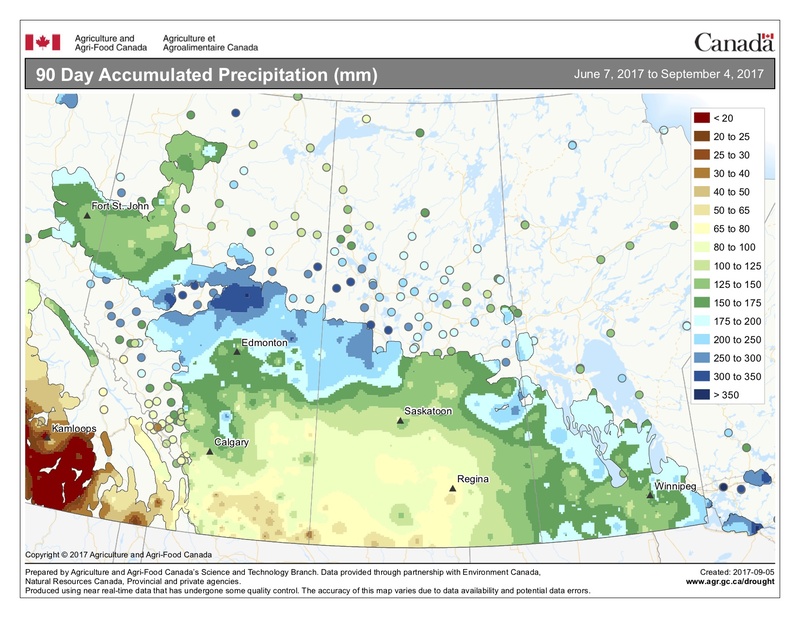 Accumulated precipitation for the 90 days leading up to September 4, 2017. Source: AAFC agro-climate map-builder. Temperature. Microbial decomposition, which is an important breakdown mechanism for most herbicides, is reduced with cool soil temperatures. Minimal breakdown occurs when soil temperatures drop below 10°C. That is why moisture during the warmer months of June, July and August is so important to herbicide breakdown. Herbicides that are broken down via chemical hydrolysis will also slow as chemical reactions occur more slowly at lower temperatures. Soil texture and organic matter. As organic matter decreases, microbial degradation of the herbicide decreases, increasing potential carryover. Soils with low clay content have decreased adsorption of residual herbicides, thereby increasing potential availability of the herbicide to sensitive plant roots when a significant rainfall occurs. Therefore, potential for injury on subsequent canola crops increases as organic matter and clay content decrease. Soil pH. For some herbicides, low soil pH increases carryover risk. For others, persistence increases with high soil pH. It helps to know your soil pH and the carryover risk factors for each specific herbicide used on that soil. Field history. Residual herbicide injury to canola can occur in fields with a history of Group 2, 4, 5 or 14 herbicide applications, but there are other herbicides outside of these groups that can present carryover risk to other crops. Review all herbicides used on a field over the past two years, and refer to specific herbicide labels for residual activity and restrictions on re-cropping to canola or any other crop. Alberta guide. Manitoba guide. Saskatchewan guide.